When Harvey rained down 275 trillion pounds of water, it bent the very surface of the Earth. Image credits: Chris Milliner / Nevada Geodetic Laboratory. It’s sometimes hard to comprehend just how strong hurricanes can be. They bring ungodly winds and rainfall, they register on seismographs, and can even push the crust down. The image above, tweeted by Chris Milliner of the Jet Propulsion Laboratory, is a visualization from the Nevada Geodetic Laboratory. The lab uses fixed GPS stations to monitor crustal movements of the area. Now, these GPS sensors revealed that the whole area had been pushed down roughly two centimeters, due to the weight of the water. When you do the math, it makes a lot of sense. As The Atlantic’s Alexis Madrigal sketches out, Harvey dropped 33 trillion gallons of water across the area it hit, so that’s roughly 275 trillion pounds. This extra mass pushes down on the crust, as several studies have already documented (the mass to sinking ratio varies from area to area, depending on several factors such as underlying rock type and elasticity). A 2017 study in Science found that the Sierra Nevada exhibits “vertical surface displacement [with] peak-to-peak amplitudes” of 0.5 — 1 centimeter. Similar effects have been noticed in the Himalayas. Typically, these slight up-down variations take place over the year or over several years, but when this extreme event happened, it greatly accelerated it. Typically, the rock rebounds after it flexes, as the Earth’s crust is geologically elastic (think of it like jumping on and off a mattress). However, it is possible that some of the subsidence is permanent. Land subsidence is a gradual settling or sudden sinking of the Earth’s surface, either due to removal or subsurface movements. Millner suspects that some of the bedrock beneath the soil might have permanently subsided, so researchers will keep an eye on the area to see what happens. The area is also prone to subsidence. Parts of the Houston areas have subsided for years, and geologists have been closely monitoring this process. 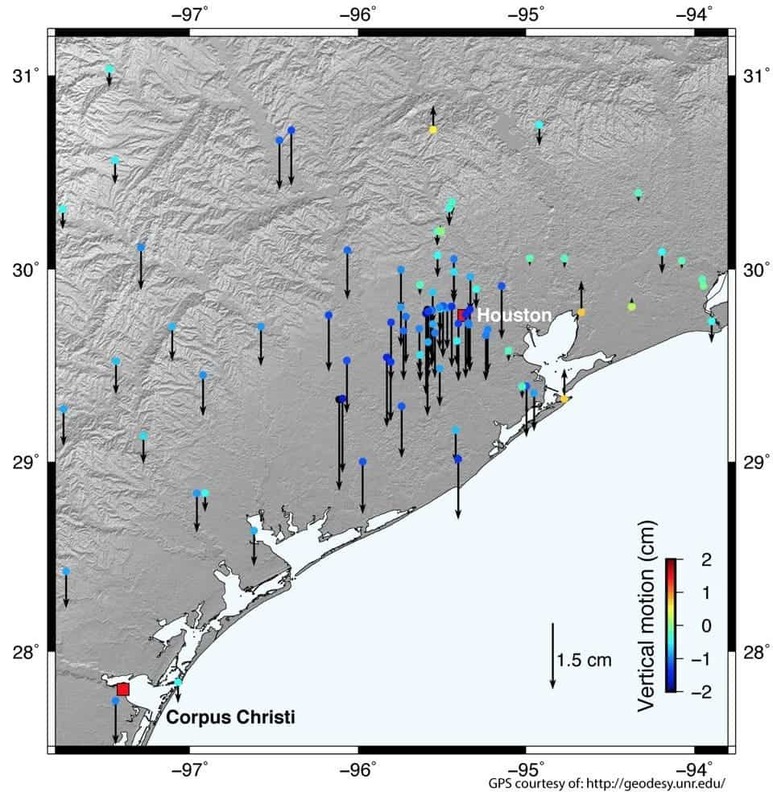 Data from the U.S. Geological Survey that shows some areas in Harris County have sunk as much as 10 to 12 feet since the 1920s, which ironically makes the areas even more prone to flooding, and subsequently even more prone to subsidence. Humans are also affecting the process. A common and worrying phenomenon that has been recorded in Houston and many other parts of the world is aquifer-related subsidence. If humans use too much water from the underground aquifers (unsustainably), these aquifers can’t refill themselves, and as a result, start to dry out. This process causes or accentuates subsidence, and can have dramatic effects.